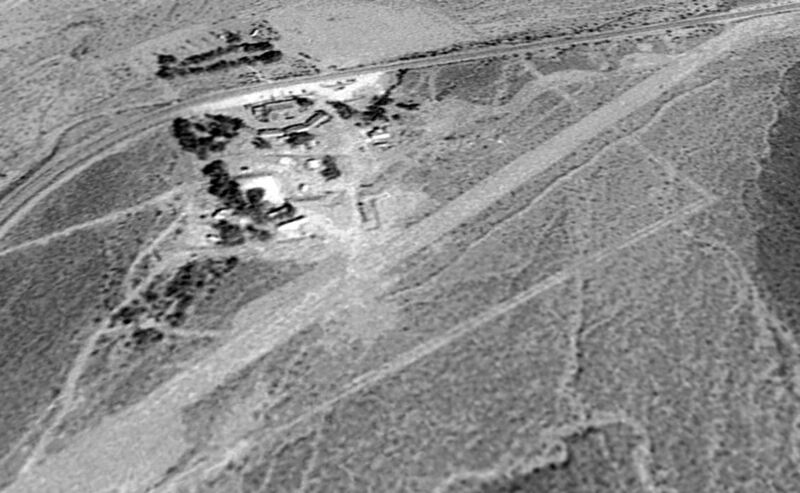 A 1995 USGS aerial view looking northeast at the Panamint Springs Airfield. 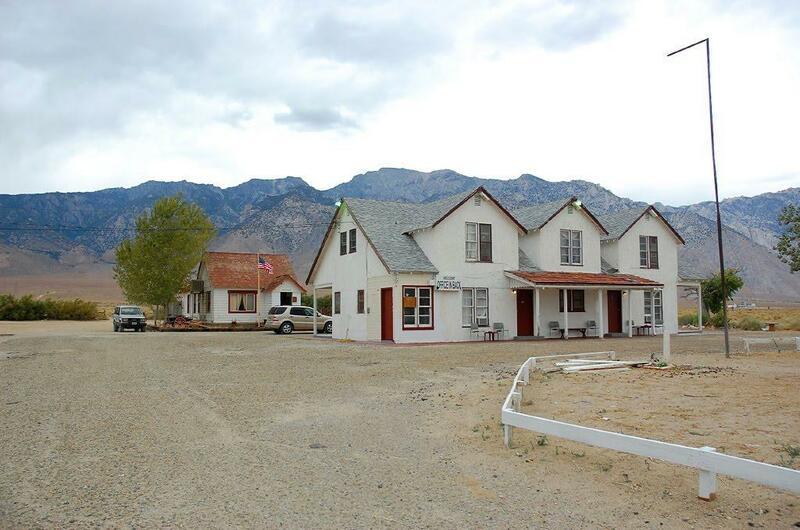 According to the Panamint Springs Resort website, “Panamint Springs Resort was originally owned & operated by Buffalo Bill Cody’s cousin, Agnes Cody. nor on the 1959 Mt. Whitney Sectional Chart. 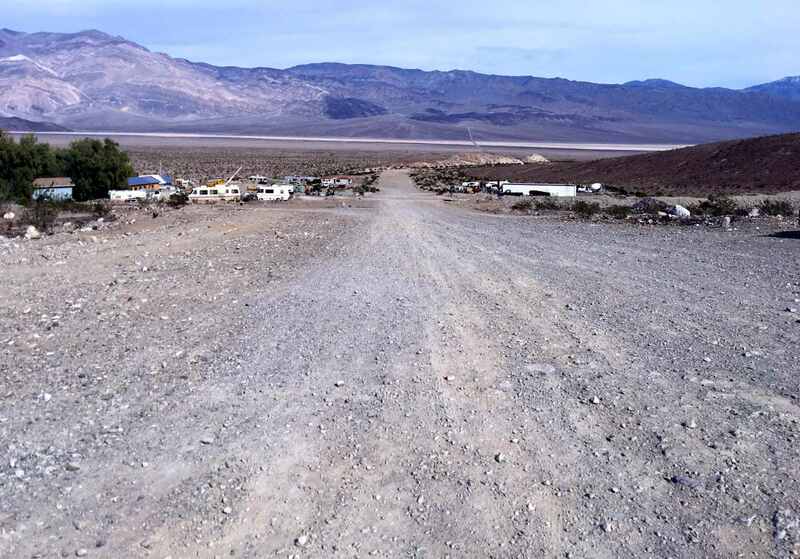 At some point before 1995 an unpaved runway was constructed on the south side of Panamint Springs. 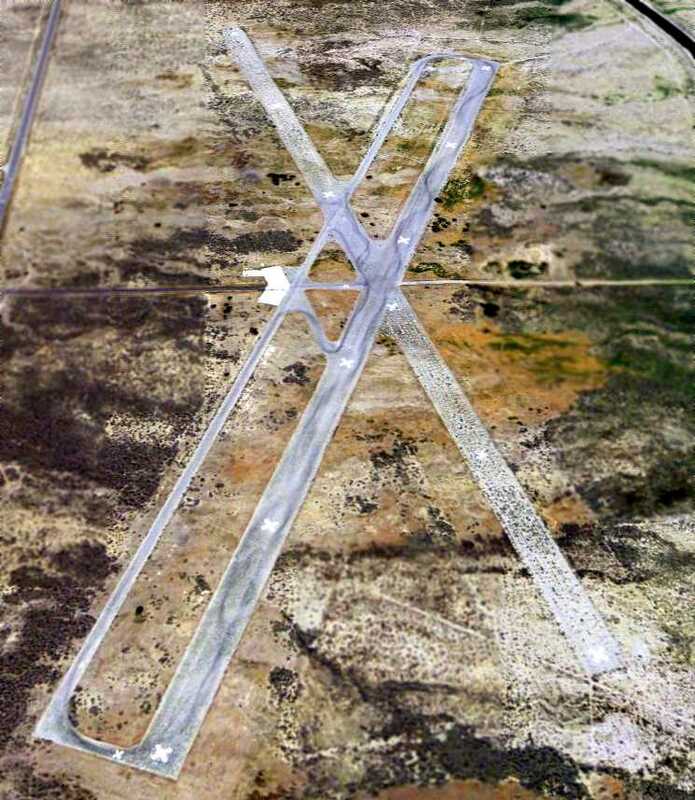 which depicted a single unpaved northeast/southwest runway. 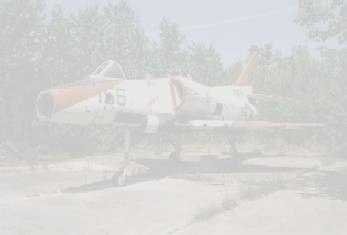 There did not appear to be any hangars or other airfield improvements, nor any aircraft visible on the field. 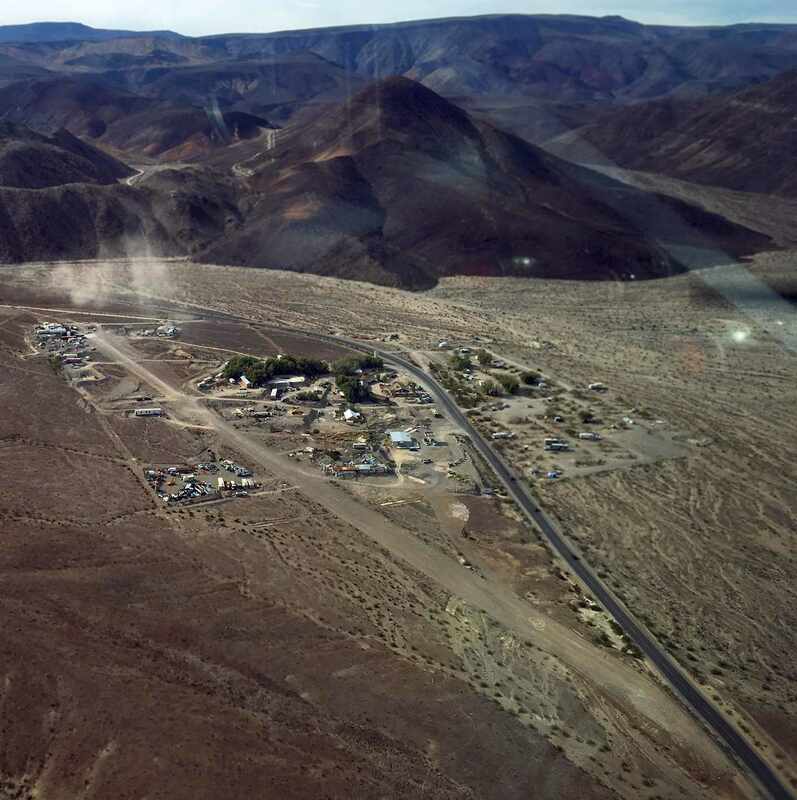 A 2013 aerial view looking northeast at the Panamint Springs Airfield. A 2/28/16 photo by Todd Schultz of the Panamint Springs Airfield runway. A 2/28/16 photo by Todd Schultz of his beautiful Howard at the Panamint Springs Airfield. A 2/28/16 aerial view by Todd Schultz looking west at the Panamint Springs Airfield. Panamint Springs Airfield is located on the south side of Route 190, west of Panamint Valley Road. Thanks to Todd Schultz for pointing out this airfield. 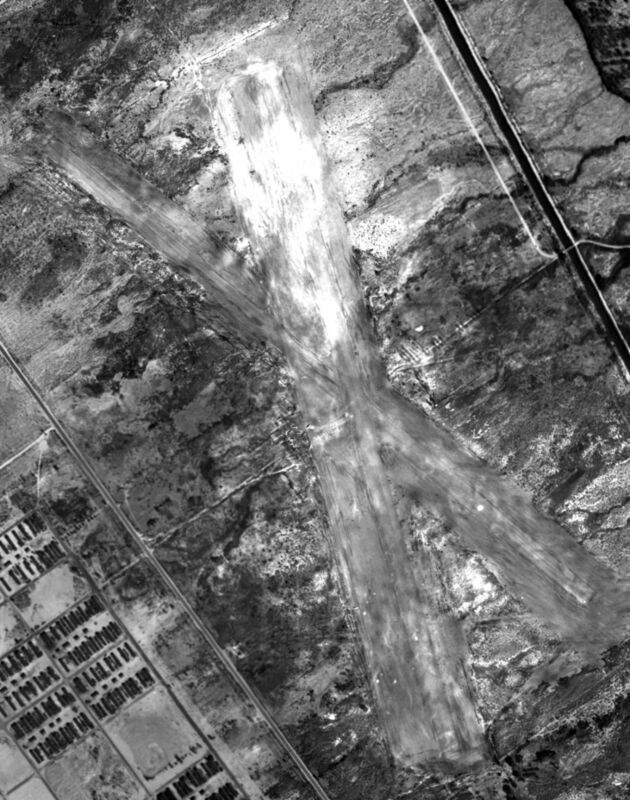 Grant Airport, as depicted on a 7/16/47 USGS aerial photo (enhanced by Bill Grasha). 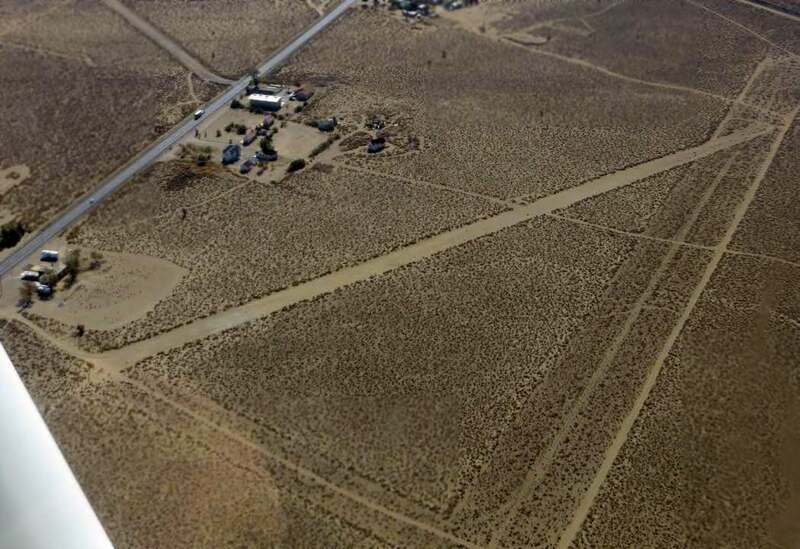 which depicted it as having 3 unpaved runways on the west side of Route 395. The 1951 USGS topo map depicted Grant Airport as having 3 runways, with several small buildings along the east side. The earliest aeronautical chart depiction which has been located of Grants Airport was on the May 1957 Mt. Whitney World Aeronautical Chart. 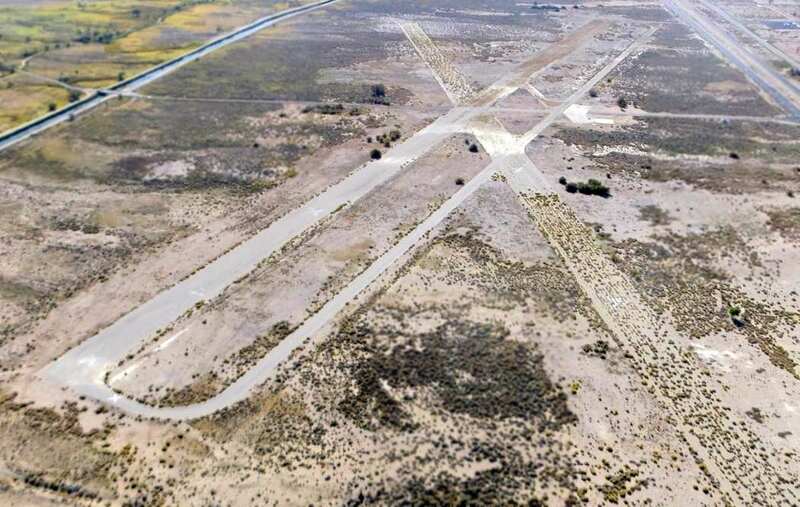 It depicted Grants as having a 3,100' unpaved runway. 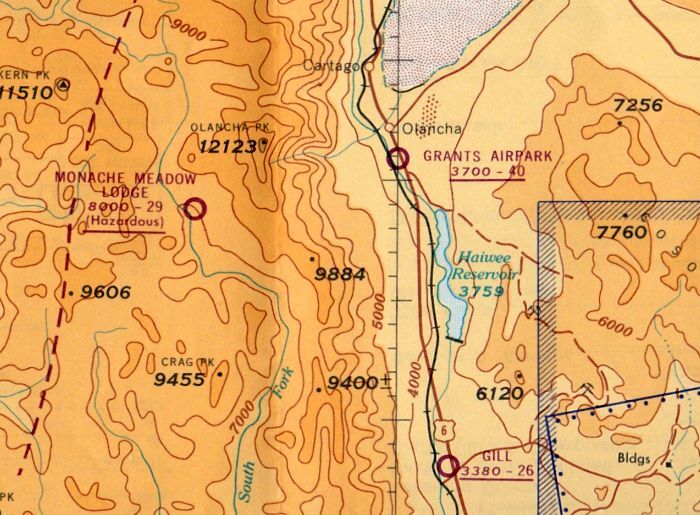 The last aeronautical chart depiction which has been located of Grants Airpark was on the October 1962 Mt. Whitney Sectional Chart (courtesy of Paul Columbus). It depicted Grants Airpark as having a 4,000' unpaved runway. A 2011 photo (courtesy of Leigh Kelly) of the Ranch Motel, which sits adjacent to the east side of Grant Airport. Leigh Kelley reported in 2014, “My chiropractor told me about running across a fascinating place in the middle of nowhere on US-395. He had needed to stop for the night on his way to Mammoth Mountain years ago & the first place he saw was a white 2-story house called the Ranch Motel. He said that there was nothing else around it. There had been a community there called Grant. A 5/25/13 aerial view looking northwest showed the Grant runways remained intact. An October 2014 aerial view by Dustin Mosher looking southeast showed the Grant runways remained intact. A 9/14/15 photo by Todd Schultz of his 1964 Schweizer 1-26b glider “that I restored over the last few years” on the Grants Airport runway. 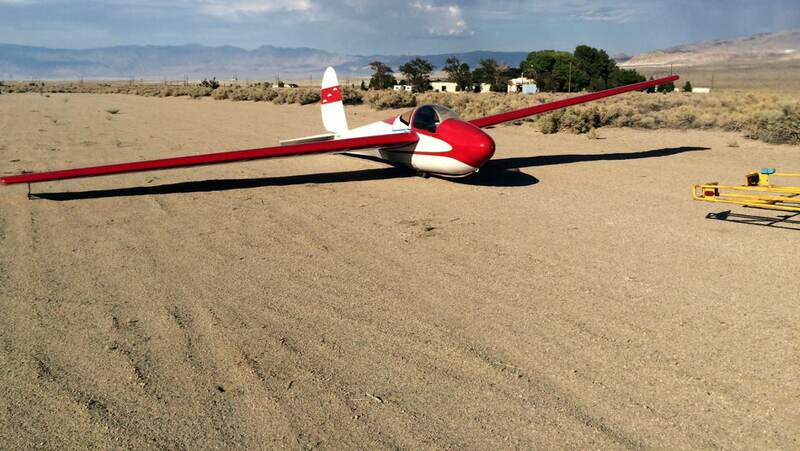 A 9/14/15 panoramic photo by Todd Schultz of of his 1964 Schweizer 1-26b glider at Grants Airport. Todd observed, “The runway is in good shape & is slightly soft. Bushes are starting to take over the south end. 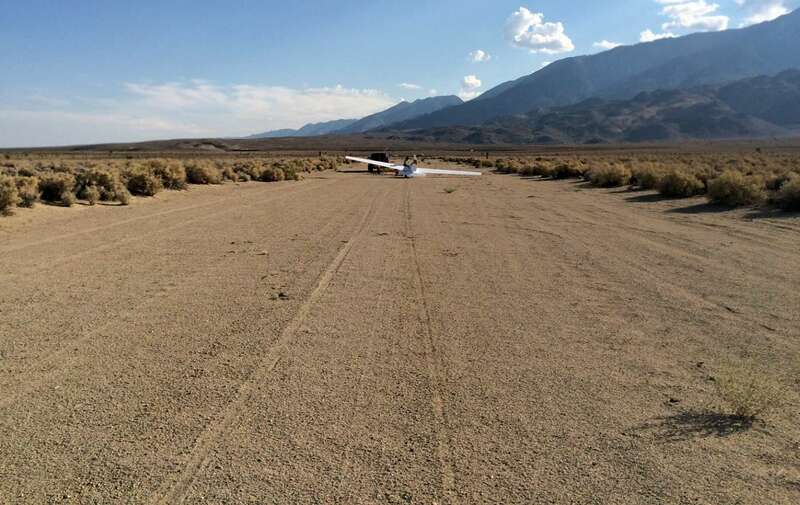 We use it as an auxiliary landing field for sailplane flying along the Sierras. A 9/14/15 photo by Todd Schultz of his 1964 Schweizer 1-26b glider on the Grants Airport runway. 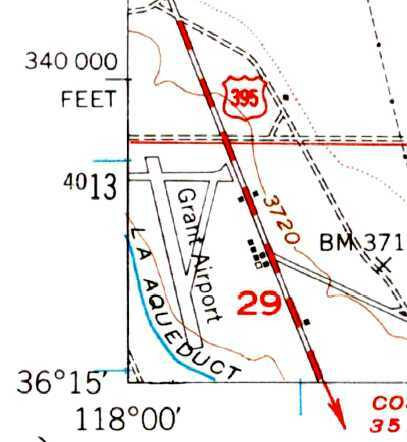 Grants Airport is located west of the intersection of Route 395 & Cactus Flats Road. 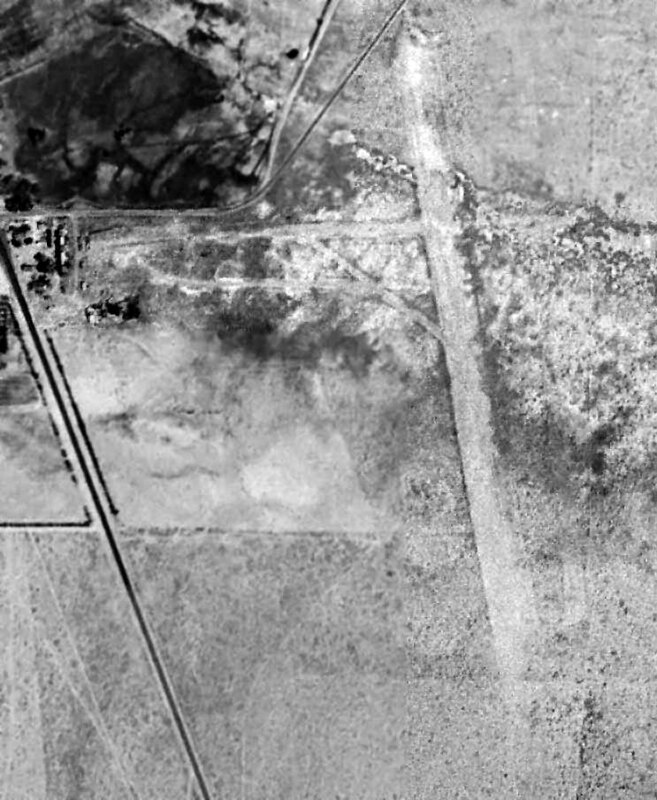 Adamson Airport, as depicted on a 8/1/43 aerial view looking north from the 1945 AAF Airfield Directory (courtesy of Scott Murdock, enhanced by Bill Grasha). was a 8/1/43 aerial view looking north from the 1945 AAF Airfield Directory (courtesy of Scott Murdock). It depicted Adamson as having 2 unpaved runways. 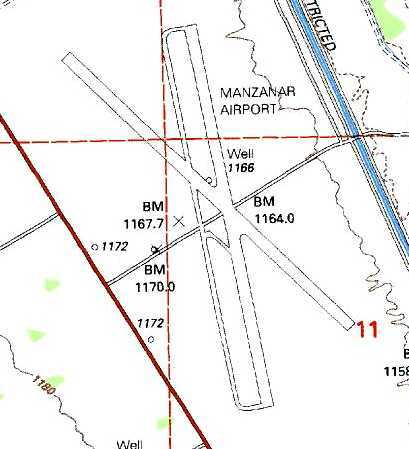 having 2 bladed runways, measuring 2,700' north/south & 1,000' east/west. The field was said to not have any hangars, and to be owned & operated by private interests. The earliest aeronautical chart depiction which has been located of Adamson Airport was on the 1945 Mt. Whitney World Aeronautical Chart. 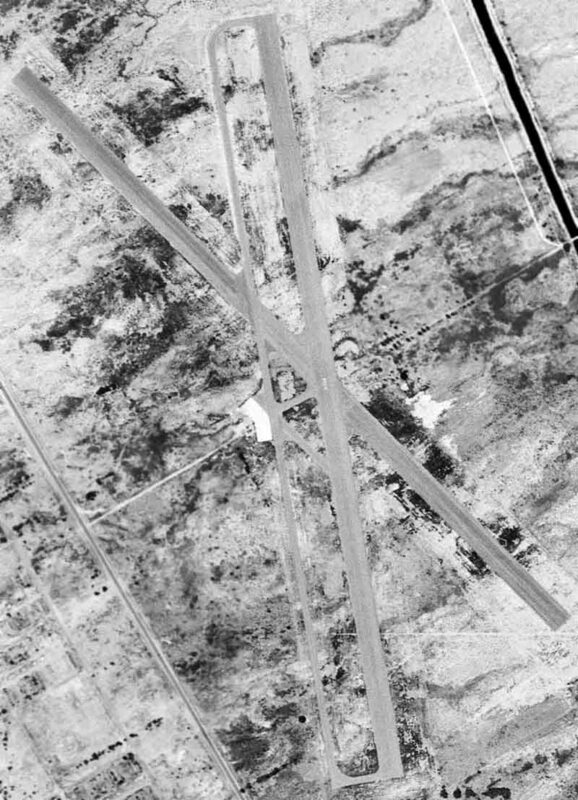 It depicted Adamson as an auxiliary airfield. 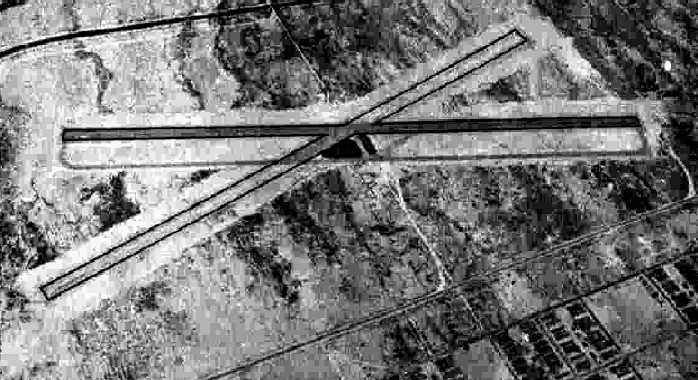 A 7/16/47 USGS aerial view (enhanced by Bill Grasha) depicted Adamson as having 2 unpaved runways. A 1947 photo of a family reunion at Adamson Field (courtesy of Ken Harbison). According to Ken Harbison, “Left to right: My father, Raymond Harbison, my mother, Kathleen Harbison, she is holding my older brother John Harbison. 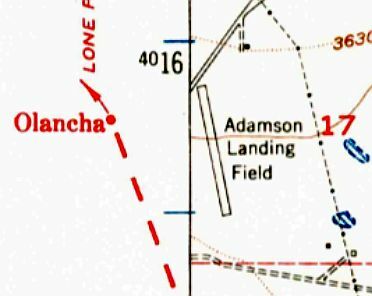 The last aeronautical chart depiction which has been located of Adamson Airport was on the 1948 Mt. Whitney World Aeronautical Chart. 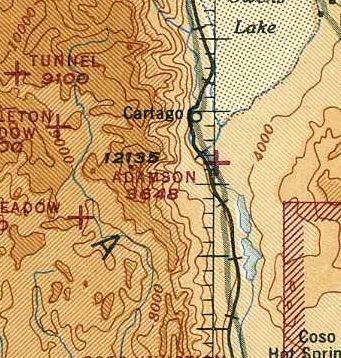 The 1951 USGS topo map depicted Adamson Landing Field as having a single northwest/southeast runway. 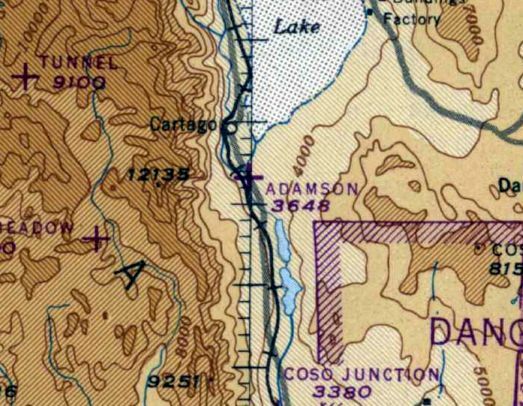 Adamson Airport was no longer depicted on the October 1962 Mt. Whitney Sectional Chart (courtesy of Paul Columbus). 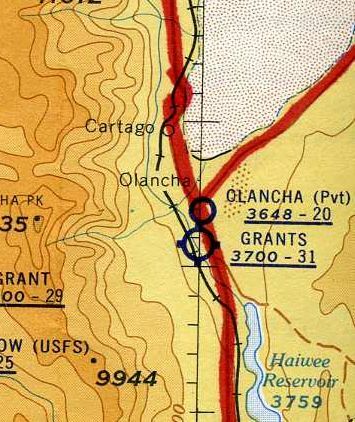 The 1985 USGS topo map still depicted a single northwest/southeast runway, labeled simply “Landing Strip”. as it was no longer depicted on the 1987 USGS topo map. with the site covered by what appeared to be a waterskiing basin. 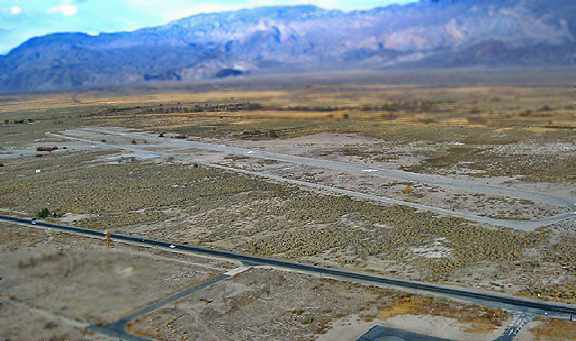 The site of Adamson Airport is located southeast of the intersection of Route 190 & Route 395.
so that they would fall into National Defense Airway standards. Also in this package were monies & instructions to build an airport at Manzanar. This airport would have runways 5,300' in length, and would include runway lights & a beacon. and it would be for use by the public until such time that it would be needed by the military. 619 acres were leased; however the report claims the lease was never recorded." not be used for airport purposes for more than one year. [to be used by US forces in the event of a Japanese invasion of the West Coast]. They were to be run as tent cities, by forces who would fall back to the next 'ring' if necessary. If they had to fall back, they didn't want to leave a lot of facilities to an invader. Support would have been by the rail line. who might be based deeper in the interior, then move to forward bases only for rearmament & refueling for short sorties. Repairs would be done at the home bases, such as Wendover (Utah) or March Field (Riverside, CA)." to which civilians of ethnic Japanese background were relocated from 1942-1945. Laurie Bush recalled, “I took a tour of the Internment camp [circa 2005]. There was an elderly gentleman in my group that was in the camp as a child. and would see planes as large as the B-24 landing there as crews geared up for the big push in the war." was an 8/1/43 aerial view looking east from the 1945 AAF Airfield Directory (courtesy of Scott Murdock). It depicted the field as having 2 paved runways. with what appear to be Taylorcrafts in front of a hangar & operations building. and the tarpaper barracks of the Manzanar Relocation are visible just above the planes on the left. it was definitely used to train pilots for the Civilian Pilot Training Program (CPTP). and did not indicate that any military operations were conducted from the field. A 10/1/44 aerial view of Manzanar Field (from the UCSB Library) showed what appeared to be quite a few light single-engine planes parked west of the runway intersection. Also note the multiple buildings of the Manzanar Internment Camp across the road at bottom-left. Ed Lansberg recalled, "I took my first dual there in November of 1944, during the war." However, he did not provide any other details. as a 700 acre rectangular property having 2 bituminous 5,000 runways, oriented north/south & northwest/southeast. to be owned by Inyo County, and operated by private interests. 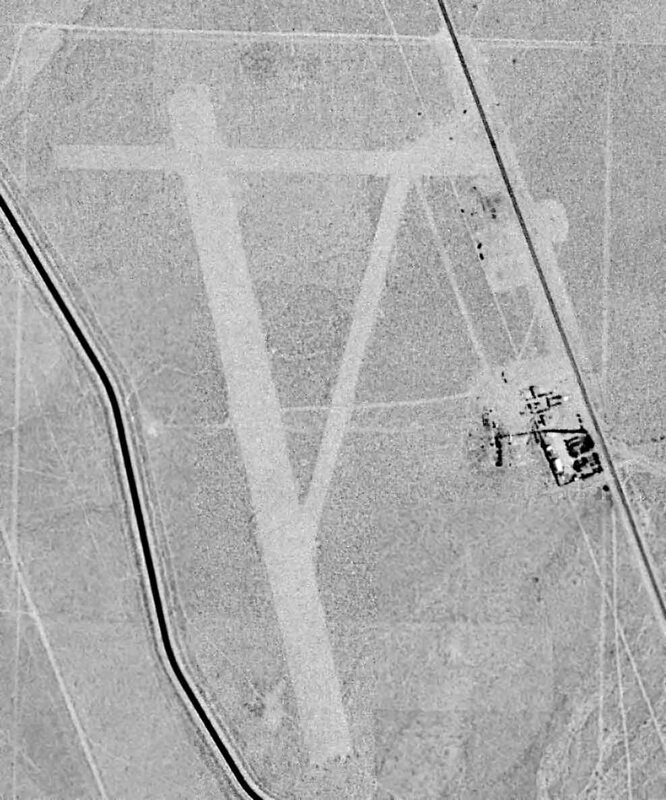 A 7/17/47 USGS aerial view (enhanced by Bill Grasha) depicted Inyo County Airport as intact though apparently not in use. and that the premises had not been used for airport purposes for more than one year. and the wind sock & tower were removed in 1957.
was leased to local ranchers for grazing purposes & used for a variety of special events. 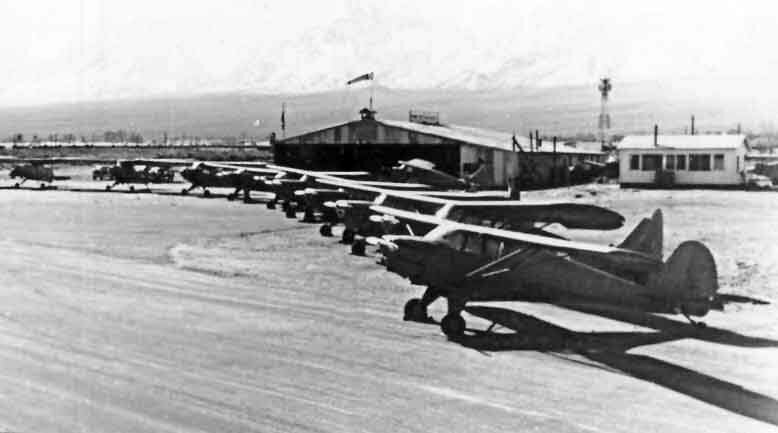 In 1957 the airport was used as a bivouac area for an advance party of the NV National Guard. and in 1958 work commenced to remove electrical equipment, including the obstruction lights. The 1958 USGS topo map depicted Manzanar Airport as having 2 paved runways & a parallel taxiway. depicted Manzanar Airport as having 2 paved runways, with the longest being 5,000'. was granted permission to use the Manzanar Airport land & runways for experimental tests. according to Scott Aguilar (a member of the Lone Pine Time Trials Committee). Lane Leonard reported, “It was 1975 or early 1976 when Roger Neff flew a Mercer Airlnes DC-3 into Manzanar with Captain Jim Seccom. They picked up part of a movie crew that was filming a documentary on the Manzanar Camp. 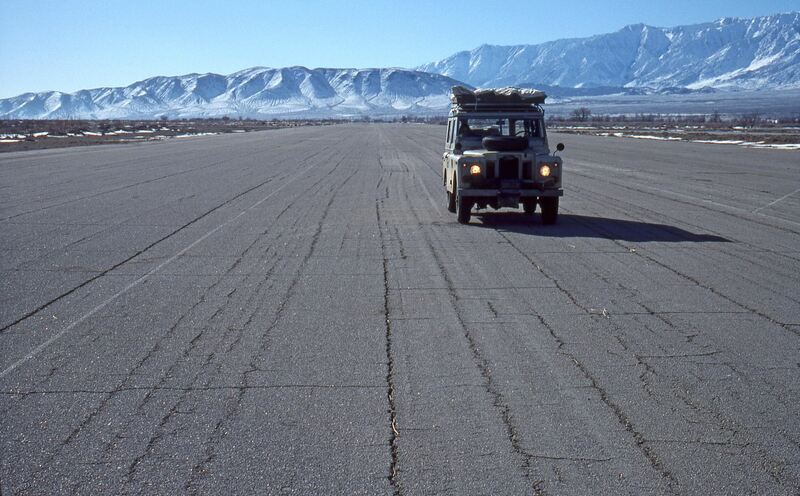 A February 1976 photo looking along a Manzanar Airport runway. John Hazlet said in 2003, "I tend to go with the theory that Manzanar was built as a military field. that it deformed the fuselage in the BE-35 I was flying enough to pop the door open). I dragged over the abandoned Manzanar field, but it looked like it was covered with rocks. I got down a little lower, and the 'rocks' turned out to be cow pies. re-latched the door, and continued to BIH." than would be likely for a remote, little-used county facility." 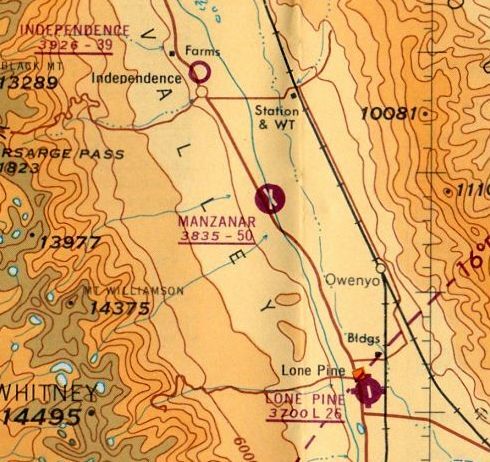 It was labeled "Manzanar Airport" on the 1994 USGS topo map. A 2001 aerial view by J.D. Lawson looking south at Manzanar Airport. The airfield consists of two 4,800' paved runways, one of which has a parallel taxiway. 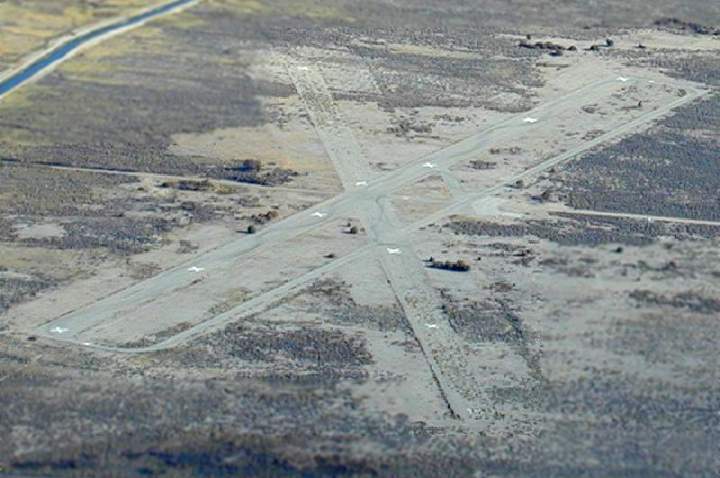 Both runways are still marked with "X" closed runway symbols. A small paved ramp sits at the runway intersection, but all buildings had been removed. 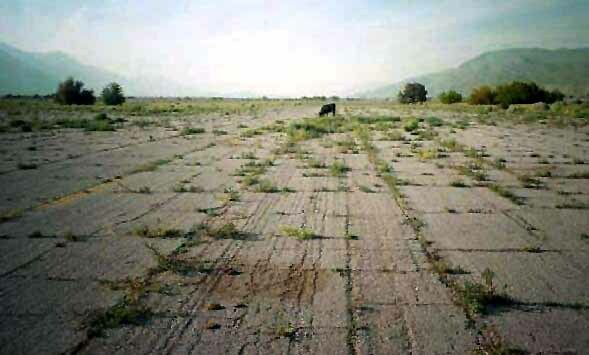 A circa 2000s picture of a solitary cow grazing on grass growing up through the cracks in the pavement of one of the runways at Manzanar (enhanced by Bill Grasha). 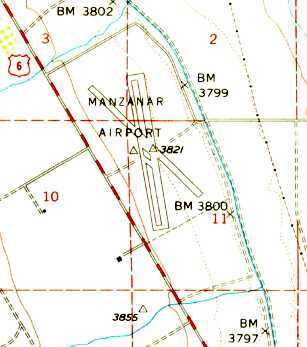 The field is still depicted as an abandoned airfield on 2002 aeronautical charts. A beautiful 2002 panoramic photo by Larry Turoski, looking south from Manzanar's runway intersection. 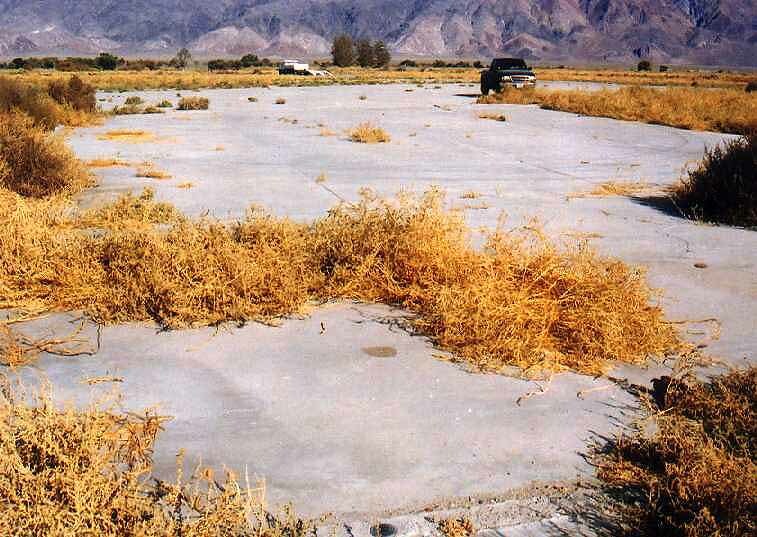 A 2003 photo by Larry Turoski (enhanced by Bill Grasha) looking east at the apparent foundation of a former hangar at Manzanar. Larry Turoski reported in 2003, "There are indeed 2 foundations left. One was, I'm certain, a hangar. with a low berm between it & the ramp where I assume the hangar door was. There is no evidence of tracks for the hangar doors. The entrance faces approximately due east. There is an adjoining portion on the north side the slab that was, I presume, office or shop space. Just to the north of this shop space is another small foundation that may have been an outbuilding, or a second office. with the 100' dimension running from front to back, i.e., east to west. Etched into the parking ramp concrete immediately 'outside' the hangar was this: SN IG 6-26-42 RW." Larry continued, "I found a USGS bench mark in the hangar foundation. You can see the bench mark in the extreme foreground of the upper picture. The benchmark was dated 1952. I gave the only structure a closer look & it indeed appears to have been an electrical or utility building of some sort. and the remnants of a large switch of the type one throws in circuits with lots of juice. There was a second USGS benchmark cemented to the side of this building dated 1962, but I think the building predates that. and reinforces my opinion that it wasn't really a parallel taxiway, but space for extra parking. The cement parking ramp has tie-down rings embedded in it, and they are huge. They weren't for tying down Airknockers or Piper Cubs." Chris Kennedy reported in 2003, "I stopped by the old Manzanar airfield. I don't see how it could have been anything but an emergency strip because there isn't any parking area. On the aerial photos you can see the very small concrete pad on the west side. It has a few tie down rings, but it wouldn't have accommodated very many airplanes. 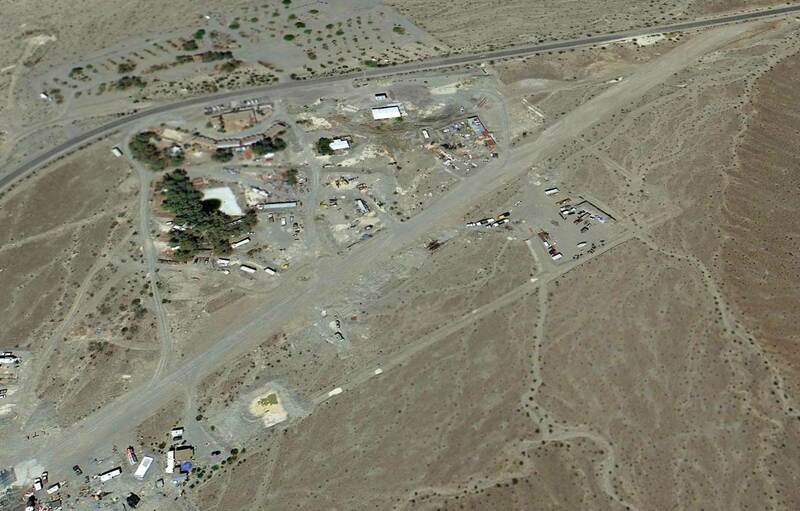 On the other hand, I don't know why Inyo County would build such a large airport in the middle of nowhere like that. On the other hand, they used to film a lot of movies in that area. Maybe they built it to allow the movie people to fly in & out. Probably not. none of the other centers had airfields, as far as I know. Quite a mystery. 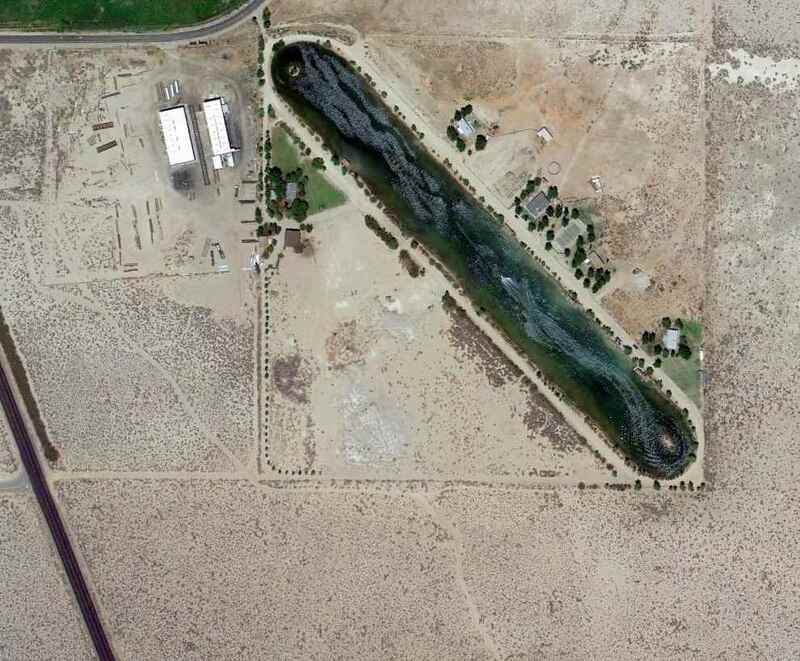 which owns the aqueduct adjacent to it. There was a sign by the road in with their name on it saying it was a day use area, no overnight camping allowed. 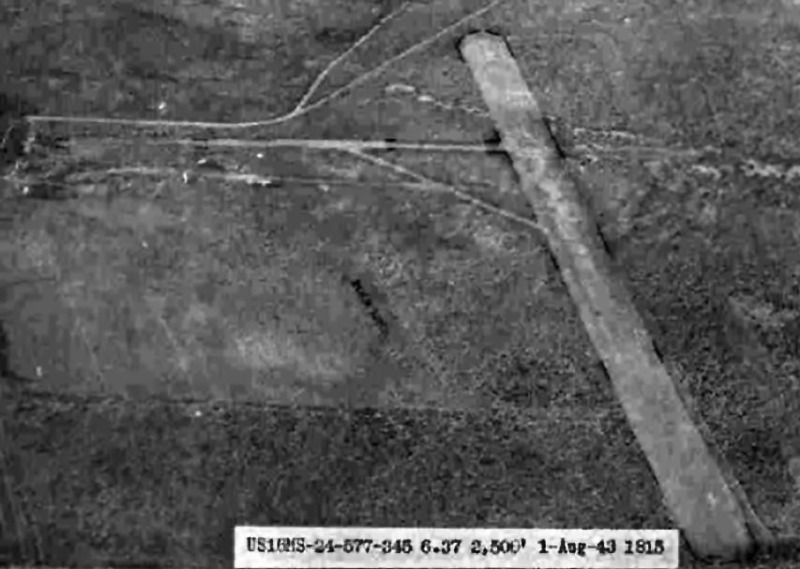 The aqueduct has been there longer than the airfield." that the use of the runways for automobile racing time trials “continues to this day. traditionally on the weekend before Memorial Day, but this has varied slightly in recent years. It is a charity event, with all proceeds going to the LA Braille Institute Youth Center. Black tire marks from one of our events are visible in the overview photo. and patch major holes in the runway surface which lie near the driving line. After the event, we are required to repair the white 'X's as needed if we have left any marks on them. A 12/30/05 aerial view looking northwest shows the 2 large runways, parallel taxiway, and ramp which remain intact. A 2006 aerial view taken from a remote-controlled aircraft by Jeff Moore, looking northeast at the Manazar runways. which aired during the 2007 Superbowl (airfield identified by John Szalay). A 3/26/08 view looking across the Manazar runways toward the beautiful snow-capped mountains. An October 2014 aerial view by Dustin Mosher looking south at the Manzanar Airport. 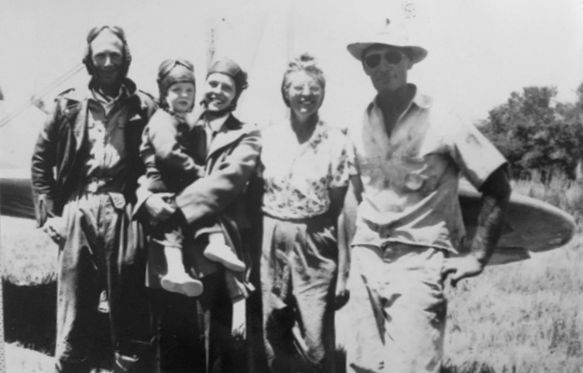 Pierce Stewart reported in 2015, “Even though it’s closed, every time I fly up the Owens Valley, I land at the long closed Manzanar Airport. Lane Leonard repored in 2018, “I drove by there on my way to and from Mammoth & it looked like the runway is now in disrepair. 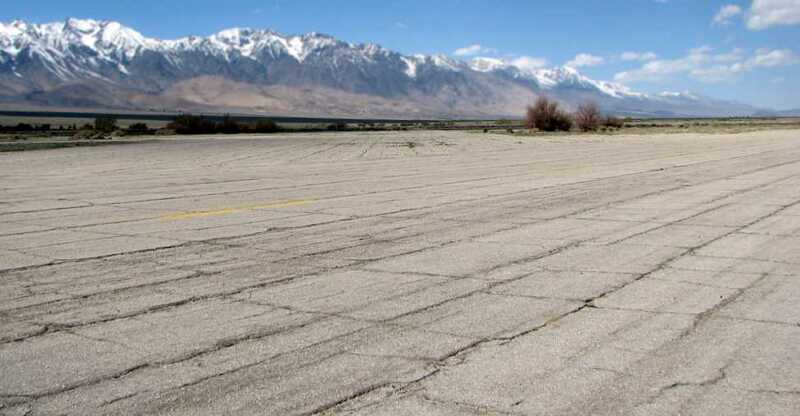 The Manzanar airfield site is bisected by Manzanar Reward Road (which passes right through the runway intersection). 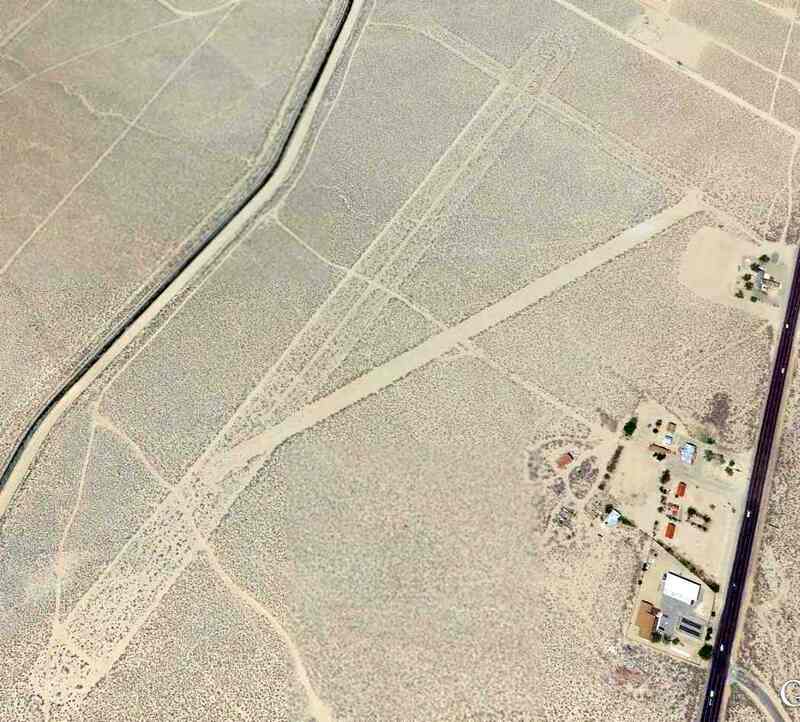 The airfield is bordered on the west side by Route 395, and the Los Angeles Aqueduct on the east side. The site of the relocation center is on the other side of Route 395.